Last year, I earned 117,166 US Air Dividend Miles from the US Air Grand Slam at an incremental cost of $636 or 0.54 cents per mile. This is one of the lowest rates at which I’ve earned miles. But it was also very time consuming and I needed to record, track, and meticulously follow up to ensure that everything was in order. If you are not familiar with the US Air Grand Slam promotion, you earn “hits” for every activity you complete from the list, and multiples of 4 “hits” earn you bonus miles. The bonus miles keep on increasing as you progress towards 40 hits (out of a total of 72) for a total of 110,000 bonus miles. Activities include buying flowers, renting cards, shopping on Amazon.com and more. 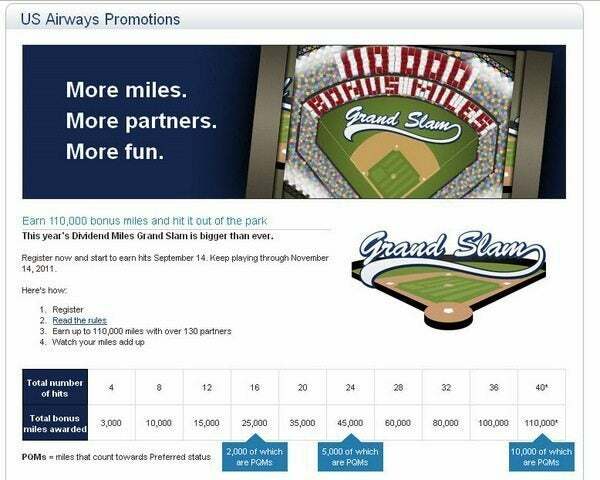 I plan on earning 36 hits for a bonus of 100,00 miles in the US Air Grand Slam. You can buy US Air miles regularly for 1.5 cents per mile, so you shouldn’t be willing to pay more than 1.5 cents, on average, for all the miles you acquire through this promotion. In fact, you should pay less than 1.5 cents per mile, because of all the trouble and time spent (your opportunity cost or cost of not doing something else in the time spent to complete 36 hits or partner activities). My target is a maximum 1 cent per mile for 100,00 miles or $1,000 spread over 36 hits. This works out to ~$28 per hit (100,000 bonus miles/36 hits) ignoring the bonus miles earned from the qualifying activities themselves. So on average, I should not spend more than $28 to earn a hit. So, some hits will cost me less than $28 and some hits will cost me more than $28. But why stop at 36 hits and not go for all 40 hits? That’s because only US Air elite members qualify for the 40th hit. And it just doesn’t seem worth it to to buy US Air elite status just for the 40th hit. 2. 10,000 bonus mile difference. You only get 10,000 extra bonus miles for completing 40 hits versus 36 hits, and spending $200 (the cheapest way to get US Air elite status) for an extra 10,000 miles is clearly not worth it when you can buy those 10,000 miles for $150 during a US Air mile sale! Going from 28 hits to 32 hits, and from 32 hits to 36 hits yields an incremental 20,000 miles. But going from 36 hits to 40 hits yields an incremental 10,000 miles (5,000 of which are elite qualifying, but that likely won’t matter to most). There just isn’t much incentive for most folks to reach 40 hits in the US Air Grand Slam (unless you’d get there with low cost anyway). Everyone is blogging and writing about the 2011 US Air Grand Slam. But don’t let the pressure get to you. Do what’s right for you and your family given your situation and needs. There’s nothing wrong in stopping once the cheap hits dry up in the US Air Grand Slam! Yes, there will be folks earning more miles than you. You’ll probably beat them in something else. It all evens out. How are you going to use the miles? If you use them for domestic travel, 1 cent per mile may be too high a price to pay. Do the math BEFORE you play. It is going to be hard to rack up the hits if you don’t have much travel scheduled and don’t have a stash of hotel points to transfer to US Air. For example, you can get 18 easy hits (that’s 50% of the 36 hits needed for the 100,000 bonus miles!) if you are a frequent traveler – 6 via car rentals, 6 via staying in hotels, and another 6 by transferring hotel points to US Air. This is a time consuming process and you need a good tool to keep track of your hits. Fortunately FlyerTalk member silverhalide, has done an absolutely brilliant job of creating an awesome spreadsheet to keep track of your hits. I used it last year and it was invaluable in staying organized. You can download it from post #1 in this thread. If you do you use it, please say thanks to silverhalide in the FlyerTalk thread or in the comments! The spreadsheet is going to earn you a lot of miles in the US Air Grand Slam! Cost – Enter the cost for the hit in the “cost” column. I enter the incremental cost of the activity. For example, suppose I was going to send flowers to a colleague and I could buy them at the local florist for $20. But the cheapest price for flowers on FTD.com is $50. So I spent an extra $30 (my incremental cost) just to get a hit in the US Air Grand Slam. I record this cost in the spreadsheet. Posted Hits – Enter the number “1” in these cells once the partner activity posts in your US Air account. Earned Hits – This column will automatically populate once you enter data in the “Date, Miles, & Cost” column. The spreadsheet will even automatically calculate your cost per mile! Not so fast! You’ve got to register BEFORE you play. This is VERY important. Otherwise you’ll end up with stuff you didn’t really want, but no bonus miles! Register for the 2011 US Air Grand Slam. Here’s a list of cheap hits and the cost to get them. This list WILL change over the 2 months of this promotion, so be sure to double check before using it. Be sure to enter your Dividend Miles account information when completing a transaction. Otherwise there will be no record of your participation! #3 – e-miles. Cost = $0. Total Cost = $0. Make sure to select “US Air” as the sponsor when signing up. You should get 275 miles as a sign up bonus (100 miles for completing the enrollment, 100 miles for submitting your verification number from the welcome email, and 75 miles for completing your profile). Since you get 275 miles as a sign up bonus, you have to earn only 225 more miles to reach 500 miles and transfer them to US Air for a “hit.” This will take a bit of time, but may be worth it for the cheap miles! Tip: If you don’t like taking the surveys, you may just want to buy something or make a donation to get to 500 points. If you’ve already done that, search your email for an invitation from “e-rewards.” I received an invitation in 2010 and the subject line of the email read “By Invitation Only.”Sign up by following the instructions in the email. #5. Magazines for Miles. Cost = $0. Total Cost = $0. #6. Use a US Air Credit or Debit Card. Cost = $0. Total Cost = $0. I used my US Air MasterCard for a quick hit. If you haven’t got this card, you should apply for it sooner rather than later, because you have to wait for the statement to close and the miles to transfer to your US Air account. The US Air MasterCard has a 40,000 mile sign-on bonus after your first purchase, with NO annual fee for the first year or minimum purchase requirement. #7. Convert Hotel Points. Cost = $0. Total Cost = $0. Earn up to 9 hits (1 per hotel) by transferring hotel points to US Air. You have to transfer enough points to earn 850 miles. I transferred Wyndham and Choice hotel points to US Air. I value my Hilton, Starwood, Priority Club, and Hyatt points too much to part with them easily! Yes, I realize that the cost of transferring hotel points is not really $0, especially if you buy hotel points just to transfer to US Air. I will update this list of hits daily, as I play. And still to come – an explanation of the hotels, car rental, other ways to earn hits in the US Air Grand Slam. You can earn 1 hit for every transaction you make (limit of 1 per card) with a different US Air debit or credit card. US Airways MasterCard: 40,000 miles sign on bonus after the first transaction. $89 fee annual fee waived for the first year. US Airways Business MasterCard: 25,000 miles sign on bonus. $79 annual fee. US Airways Visa: 3 different versions with a 5,000 mile, 10,000 mile, and 25,000 mile sign up bonus. $50 to$90 annual fee. Note that these cards are not available for new users. US Airways Visa Business Card: I couldn’t find a link, so please let me know if you do! US Airways Debit Card: 3,000 miles after first purchase. $30 annual fee not waived. You need a bank account with Bank of America for this. The best card to apply for is the US Airways MasterCard with a 40,000 mile sign on bonus issued by Barclays. You earn 1 hit by transferring hotel points from each of the 9 hotels to US Air Dividend Miles. However, you have to transfer enough miles to earn a minimum of 850 miles. You can also buy points in certain hotel programs and then transfer them to US Air. The cheapest way to do this is to use the Priority Club “Cash and Points” trick to buy 10,000 points for $60 and then transfer those points to US Air. It may be worth it to buy hotel points to transfer to US Air if you are just 1 or 2 hist away from a bonus threshold. For example, if you need another 1 hit to get a 20,000 mile bonus, it may be worth it to pay $60 to buy hotel points and then transfer them to US Air. You could also transfer Chase Ultimate Rewards points to Priority Club, Marriott, and Hyatt and then transfer those hotel points to US Air. Best Western: Transfer 5,000 points to 1,000 Dividend Miles. But only elite members can buy points in increments of 1,000 points ($50 for 5,000 points). However, it is very easy to status match. I just status matched my Hyatt Diamond (earned at StarMegaDO3) to Best Western’s Diamond status. 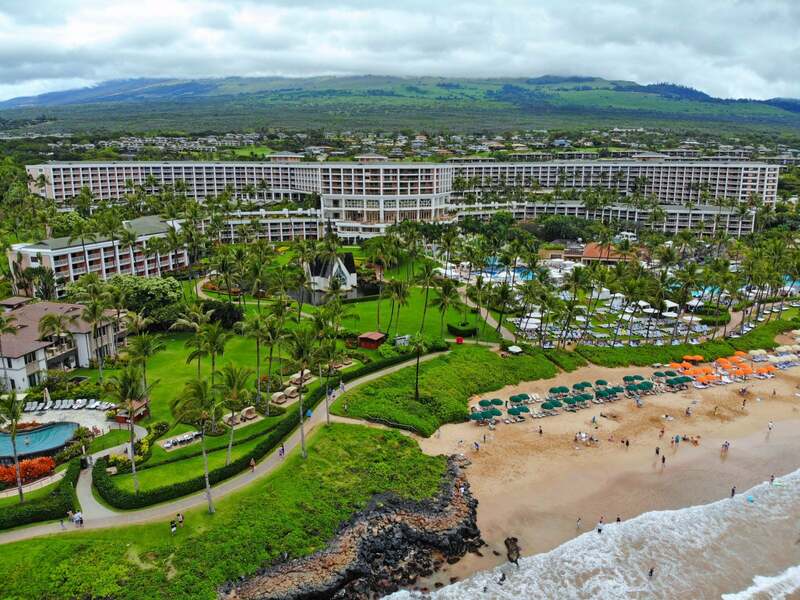 Hyatt: Transfer 5,000 Hyatt points to 850 Dividend Miles. Buy 5,000 Hyatt Points for $120. You will get a 20% bonus for Hyatt point purchases made before September 30, 2011. You can also transfer Chase Ultimate Rewards points to Hyatt. Priority Club: Transfer 10,000 Priority Club points to 2,000 Dividend Miles. Buy 10,000 Priority Club points for $60 using the cash and points trick or transfer Chase Ultimate Rewards points to Priority Club. Raddison (Club Carlson): Transfer 8,000 points to 1,000 Dividend Miles. There is no option to purchase points. 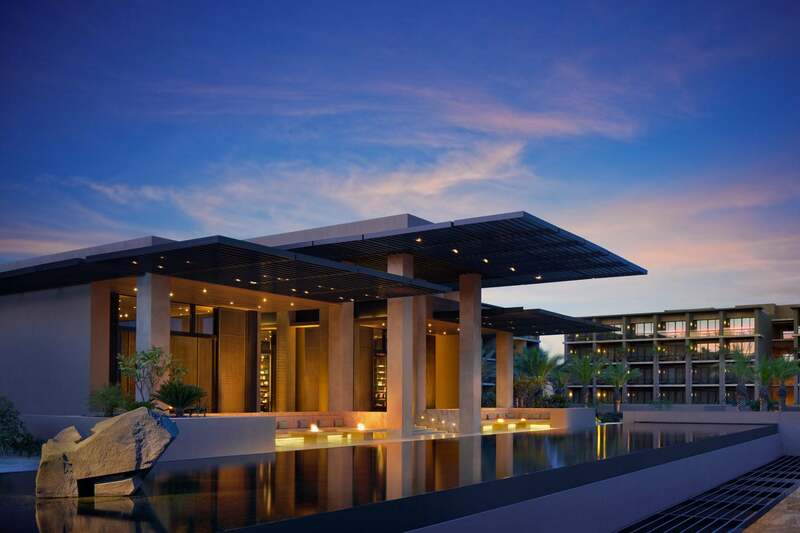 Starwood (SPG): The transfer amount varies by membership level. Platinum elite members can transfer a minimum of 1 point so need to transfer 850 SPG points for 850 US Air miles. Gold elite members can transfer a minimum of 1,500 points and all other members have to transfer a minimum of 2,500 points. Wyndham: Transfer 8,000 Wyndham points to 3,200 Dividend Miles. There is no option to purchase points. In the meantime, how has the US Air Grand Slam gone for you? Hi Daraius, where can I track how many hits I’ve earned so far on the site to make sure they are all posted? I can’t find it on the US Airways site… Thanks. @Jenny – The best way to check is to log in to US Air and check your mileage balance (search for all activity from Sept 15 to date). You’ll see which transactions have posted and your Grand Slam bonus tier. From that information, you can determine which transactions have not yet posted. I’m about to get $25 e-reward currency so I checked out Rewards section. I have never redeemed on e-reward before. It offers 250 us miles for $0 e-reward currency. So I redeemed for it. Does it count as a hit or do I need to redeem again when I reach $25 in order to earn a hit. I order a wine tasting note book instead of signing up for the club. Mommypoints warned in her blog to do this at own risk. I thought I would give it a shot. And I did earn miles. But I do not know if that qualifies for a hit. I have 21 activities posted and earned 20 hits so I can’t tell the wine book qualifies for a hit. Any thoughts? 8:34 amOctober 27, 2011 Bill H.
E-Miles. I am guessing here, but I think the “timeliness” of E-Miles providing links to go to for points is somehow based on how your profile is filled out. If you select “Some interest” or “High interest” I think you will get more links to build your point total faster than if you select “Low interested” or “No Interest”. Either way, E-Miles was the most annoying hit yet ! I think you may have a mistake in your info. Or I am missing something. The 10K points for 60 bucks via priority club isn’t working for me. The price I am seeing is 135 bucks. Just thought you might want to know…unless…again…I am missing something here…cheers!